WIU agriculture students Grant Reed, Kylee Johnston, Luke Merritt and Keely Egelhoff stand by some of the food collected for a new food bank. Food for the new resource was collected during WIU's Homecoming celebration in late September. 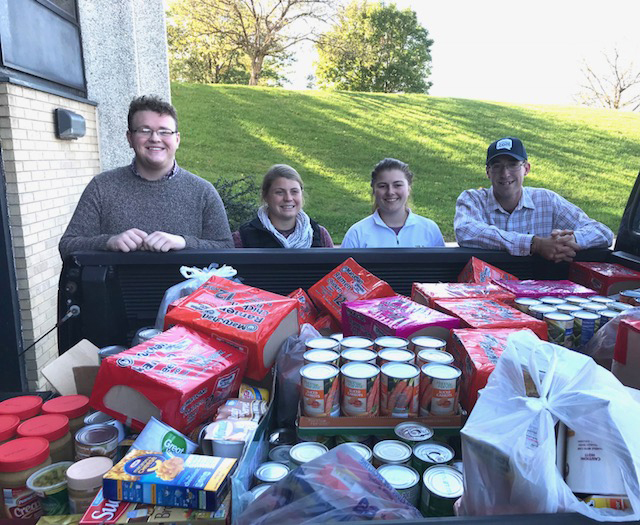 MACOMB, IL – A campus survey about food availability for Western Illinois University students has resulted in the development of a food bank by students from the WIU School of Agriculture. The survey, created and disseminated by Assistant Professor of Dietetics, Fashion Merchandising and Hospitality Emily Shupe, showed 48 percent of answering students have gone hungry in the past 30 days. 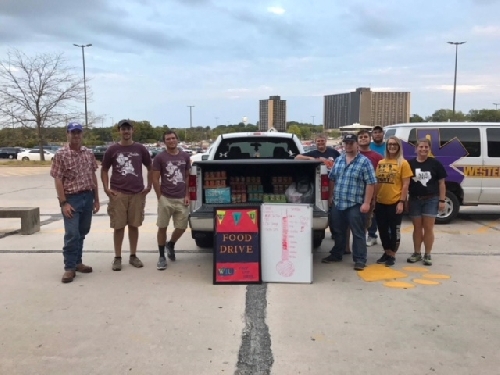 The results sparked WIU ag students to conduct a food drive during the University's Homecoming celebration in late September, in conjunction with the WIU Homecoming Committee and Homecoming participants. Items were collected during the cardboard boat regatta, the variety show and spirit games, which brought in more than 1,100 pounds of food to kick off the food bank. Currently, the food bank is based at the Campus Students for Christ house, at 1545 Riverview Drive in Macomb. "Our group decided to do the food drive because we felt like, after seeing the survey, that we should join together to help each other out so we can succeed in our future careers," said WIU junior agriculture major Kylee Johnston, of Carthage, IL. For more information about the food bank, email Jana Knupp at JM-Knupp@wiu.edu.